It was a Yamaha lock-out of the first three places at Jerez today with maybe the biggest surprise being that it was Valentino Rossi and not pre-Jerez test king Jorge Lorenzo that posted the fastest time. The Italian showed he’d lost none of the mercurial talent that propelled him to nine world titles as he took ‘pole position’ for the second day of testing with a weekend best of 1:39.525s, a full 3.5s faster than his Qualifying time at the same circuit last April and, perhaps more impressive, Rossi’s time was 0.007s faster than Jorge Lorenzo’s grid-heading time set in that same Qualifying session. The day, as yesterday, started very slowly with only Avinitia Blusens rider Hiroshi Aoyama heading out to report track conditions to the rest of the paddock, at least that’s what it felt like and it wasn’t until after lunchtime that the action began in earnest. Go&Fun Honda Gresini pair of Alvaro Bautista and Bryan Staring were first to venture on track with the two Aspar bikes of de Puniet and Espagaro and Ducati test rider Pirro but it wasn’t long before the big guns for 2013 joined them in the shape of Rossi, Lorenzo, Marquez, Pedrosa and Crutchlow. The teams were set to continue their test program held over from yesterday as the conditions became dry for the first time this weekend and as the times began to tumble to match the qualifying of last year it was Pedrosa that fired in the first fast time of the day before Lorenzo took over at the top of the list. The Doctor got in to his groove and posted the fastest time of the day on his 29th of 46 laps while Bautista took a tumble off his Honda at the fast Pons Curve fracturing the fourth and fifth finger on his left hand in the process. Sadly the rain that had blighted the test yesterday and this morning returned and brought a slightly premature halt to the proceedings but the timesheets made for the most interesting reading of the off-season. After two tests at Sepang and the recent private test at Austin for Honda and Yamaha this was the first true indication of how the season may take shape come Qatar in under two weeks time. The only other rider missing from the top five today, that PaddockChatter believes will feature at Qatar, was Repsol Honda’s Marc Marquez. The class rookie Spaniard was 1.189s back from the returning Factory Yamaha rider as the Honda squad spent most of the dry time working on the electronics rather than out-and-out pace, and LCR Honda pilot Bradl a little further down the sheets than he’d like just behind Marquez in eighth with Iannone ninth and Hayden tenth. 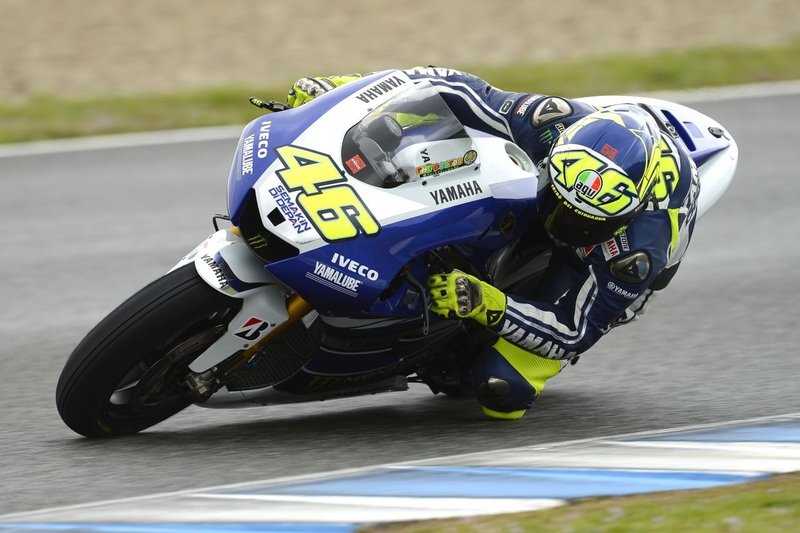 With Rossi posting the fastest time it was team-mate Jorge Lorenzo that got closest with a fastest time just 0.015s off that of the Italian and only a couple of hundreths of a second shy of his Pole time 2012. Great Britains Cal Crutchlow was third fastest only 0.049s back of Lorenzo and just 0.056 ahead of the first Honda of Pedrosa in fourth and an excellent showing from Ducati Corse pilot Andrea Dovizioso to claim fifth place with a time of 1:40.322s, a full two seconds faster than the time set by his compatriot on the GP12 last year. Dovizioso’s team-mate Spies faired less well as he continues his rehabilitation from his shoulder injury posting the 18th fastest time. Bradley Smith showed he’s making steady progress in getting familiar with his Yamaha YZR M1 setting the 12th fastest mark with fastest CRT Hector Barbera just 0.051s ahead of him, a creditable performance from the British rookie. Double World Superbike champions Colin Edwards woes continue with the NGM Forward Racing squad settling for 22nd fastest time of 25 riders ahead of Aoyama, PBM’s Michael Laverty and Came IodaRacing Project’s Lukas Pesek.